Add new kinds of sensors on-the-fly. inexpensive signal conditioning modules. Incorporate LabJack DAQ hardware using OEM options. LabJack makes data acquisition and control hardware to connect the physical world to your computer. MasTec stocks LabJack and has many sites using it. LabJack has certainly made a name for itself in the world DAQ market place. LabJack DAQ is quite unique, Advanced features. Have confidence in your measurements. Every device is individually tested and calibrated. New features and updates are readily available through field-programmable firmware. Multiple protection mechanisms on every I/O to help prevent electrical damage. Provides convenient screw terminals for the DB15 connector on the LabJack U3 and UE9. The CB15 can connect directly to the LabJack or can be attached with various types of cables (not included). Not compatible with the U12. Includes screwdriver. 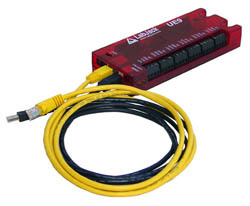 Most of the connections on the LabJack U12 have built-in screw terminals, but 16 of the digital I/O are accessed with a DB25 connector. To ease the use of these digital ports the CB25 provides screw terminal connections. For the LabJack U12 only. The EB37 experiment board connects to the LabJack UE9s DB37 connector and provides convenient screw terminal access. Also provided is a solderless breadboard and useful power supplies (+/-10 volts, 3.3 volts, and 1.25 volts). Includes a screwdriver, power supply, and jumper wires. For the LabJack UE9 only. 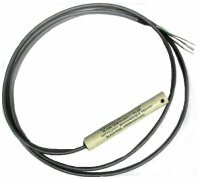 Easy to use and inexpensive temperature probe. Designed to work with any LabJack, but can also be used with any voltage measuring device. Outputs 10 mV per degree C, and has a range of up to -40 to +100 degrees C.
The EI-1050 uses two digital lines on the LabJack U12 (IO0 and IO1) to retrieve temperature and relative humidity measurements. Featuring the Sensirion SHT11 sensor, it provides 14-bit temperature readings and 12-bit humidity readings. An enable line is provided allowing multiple EI-1050 probes to be connected to a single LabJack U12. Measurement range is -40 to 120 degrees C for temperature and 0 to 100% for humidity. Accuracy is +/-0.5 degrees C (@ 25 deg C) and +/-3.5%. With LabJack U12 firmware version 1.10 or higher (Feb 2003 or later), it takes about 230/75 milliseconds to get a temperature/humidity reading. With earlier firmware versions it takes about 2 seconds to get one temperature or humidity reading. For the LabJack U12 only. Dual instrumentation amplifier provides 2 high-impedance differential inputs. Operates from a single 5 volt supply and provides a +/- 15 volt supply and a 4.096 volt reference. Analog input range is +/- 10 volts. The gain of each channel is set to 1, 10, 100, or 1000 via digital I/O or jumper wires. Typical current requirement is about 80 mA @ 5 volts, allowing the EI-1040 to be powered from a +5V terminal on a LabJack. The RB16 provides a versatile method for electricians, engineers, and other qualified individuals, to interface a LabJack U12 with high voltages/currents. The included DB25 cable connects the RB16 to a LabJack U12. The RB16 has sockets for mounting up to 16 industry standard mini I/O modules (not included). The user can also install a resistor to bypass each socket and pass through the standard digital I/O line. For the LabJack U12 only. More technical specifications about the T7 can be found in Appendix A of the T7's Datasheet. Drivers Available for Windows, Linux and Mac. The LabJack U6 has 14 external analog inputs (AIN0-AIN13). AIN0-AIN3 are available on screw terminals and also on the DB37 connector. All 14 analog inputs are available on the DB37 connector. The maximum input range is ±10 volts, with software selectable gains of x1, x10, and x100. Each analog input can be measured single-ended, or differentially in even/odd pairs. Analog input resolution is 16 bits at max speed (~20 µs conversion time), increasing to 18+ bits at slower speeds (see Sections 3.1 and 3.2 of the User's Guide). Input impedance is at least 1 GO, with typical input bias currents of only 20 nA. Command/response (software timed) analog input reads typically take 1-4 ms depending on number of channels and communication configuration. Hardware timed input streaming has a maximum rate that varies with resolution from 4 ksamples/s at 18 bits to 50 ksamples/s at 16 bits. The U6-Pro has all the features of the normal U6 with the addition of an auxiliary low-speed high-resolution (24-bit) sigma-delta ADC. Analog input resolution varies from 19.5 bits (RMS or Effective) at max speed (4 ms conversion time), to 22 bits at slower speeds (160 ms conversion time). For more information about the analog inputs see Section 2.7 and Appendix A of the User's Guide. For data rate information see Sections 3.1 and Sections 3.2. The User's Guide can be found on the U6 Support page. The LabJack U6 has 2 fixed current outputs of 10 µA and 200 µA. These are useful for measuring resistance (resistors, thermistors, RTDs). 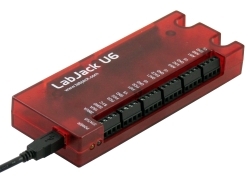 The LabJack U6 has 2 analog outputs (DAC0 and DAC1) that are available both on screw terminals and the DB37 connector. Each analog output can be set to a voltage between about 0 and 5 volts with 12-bits of resolution. The analog outputs are based on a true voltage reference. The analog outputs are updated in command/response mode, with a typical update time of 1-4 ms depending on communication configuration. For more information about the analog outputs see Section 2.8 and Appendix A of the User's Guide. For data rate information see Section 3.1. The User's Guide can be found on the U6 Support page. For more information about the digital I/O see Section 2.9 and Appendix A of the User's Guide. For data rate information see Sections 3.1 and 3.2. The User's Guide can be found on the U6 Support page. For more information about the timers see Section 2.10 and Appendix A of the User's Guide. The User's Guide can be found on the U6 Support page. For more information about the counters see Section 2.10 and Appendix A of the User's Guide. The User's Guide can be found on the U6 Support page. The first 16 I/O lines (FIO and EIO ports) on the LabJack U3 can be individually configured as digital input, digital output, or analog input. In addition, up to 2 of these lines can be configured as timers, and up to 2 of these lines can be configured as counters. Analog input resolution is 12-bits. The range of single-ended analog inputs is typically 0-2.4 volts, and the range of differential analog inputs is typically +/- 2.4 volts (pseudobipolar). For valid measurements, the voltage on every analog input pin, with respect to ground, must be within -0.3 to +3.6 volts. Command/response (software timed) analog input reads typically take 0.6-4.0 ms depending on number of channels and communication configuration. Hardware timed input streaming is not supported. 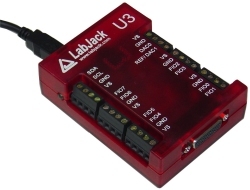 The LabJack U3 has 1 or 2 analog outputs (DAC0 and DAC1) that are available on the screw terminals. Each analog output can be set to a voltage between 0 and 5 volts with 8-bits of resolution. The second analog output is only available in certain configurations. In particular, if the analog inputs are using the internal 2.4 volt reference (the most accurate option), then DAC1 outputs a fixed voltage of 1.5*Vref. The CB15 is a simple screw terminal breakout for the DB15 connector, providing convenient access to the EIO and CIO ports. The RB12 provides a convenient interface for the U3 to industry standard digital I/O modules, allowing electricians, engineers, and other qualified individuals, to interface a LabJack with high voltages/currents. The RB12 relay board connects to the DB15 connector on the LabJack, using the 12 EIO/CIO lines to control up to 12 I/O modules. Output or input types of digital I/O modules can be used. The RB12 is designed to accept G4 series digital I/O modules from Opto22, and compatible modules from other manufacturers such as the G5 series from Grayhill. Output modules are available with voltage ratings up to 200 VDC or 280 VAC, and current ratings up to 3.5 amps. The LabJack U12 has 8 screw terminals for analog input signals (AI0-AI7). These can be configured individually as 8 single-ended channels, 4 differential channels, or combinations in between. Each input has a ±10 volt input range, 12-bit resolution, and an input bias current of ±90 microamps. Differential channels can make use of the low noise precision PGA to provide gains up to 20, giving an effective resolution greater than 16-bits. The LabJack U12 is capable of both software and hardware timed acquisition. When using software timed acquisition (also called command/response), the PC sends a command to the LabJack, and it responds with data. This mode can acquire 4 channels at up to 50 samples/second per channel, or 8 channels at up to 25 samples/second per channel. When using hardware timed acquisition, the PC sends a command to the LabJack telling it to start a burst or stream mode acquisition. Both burst and stream mode take advantage of the LabJack's precision timing crystal and high-speed sample buffer. In burst mode, up to 4,096 samples will be acquired from 1-4 channels at up to 8,192 samples/second and stored in the buffer. After the acquisition is complete, the data is transferred to the PC. A hardware trigger can be configured for burst mode that starts the acquisition when a digital input changes state. In stream mode, data is acquired from 1-4 channels at up to 1,200 samples/second and stored in the LabJack buffer. Simultaneously, the data is transferred from the LabJack buffer to the PC buffer, allowing the data to be streamed to disk continuously. Click here for more info on data rates. The LabJack U12 has 2 screw terminals for analog output signals (AO0 & AO1). Each analog output can be set to a voltage between 0 and the supply voltage (+5 volts nominal) with 10-bits of resolution. The analog outputs are controlled in command/response mode at up to 50 Hz per channel. 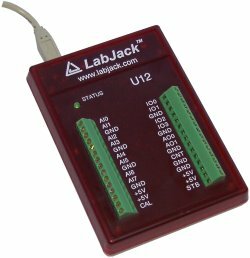 The LabJack U12 has 20 digital I/O channels which can be individually configured as input or output. Connections to 4 of the digital I/O are made with the built-in screw terminals (IO0-IO3). These 4 channels have built-in overvoltage/short-circuit protection. As inputs or outputs, they are controlled/read in command/response mode at up to 50 Hz per bit. As inputs only, they can be read with the high-speed burst and stream modes. The remaining 16 digital I/O are accessed through the DB-25 connector and controlled/read in command/response mode at up to 50 Hz per bit. These channels can sink or source up to 25 mA each (total sink or source current of 200 mA max for all 16), allowing direct interface to many relays. There is one 32-bit counter available on the LabJack U12 (screw terminal CNT), capable of counting frequencies up to 1 MHz. The counter is read in command/response mode at up to 50 Hz or up to 300 Hz in hardware timed stream mode. 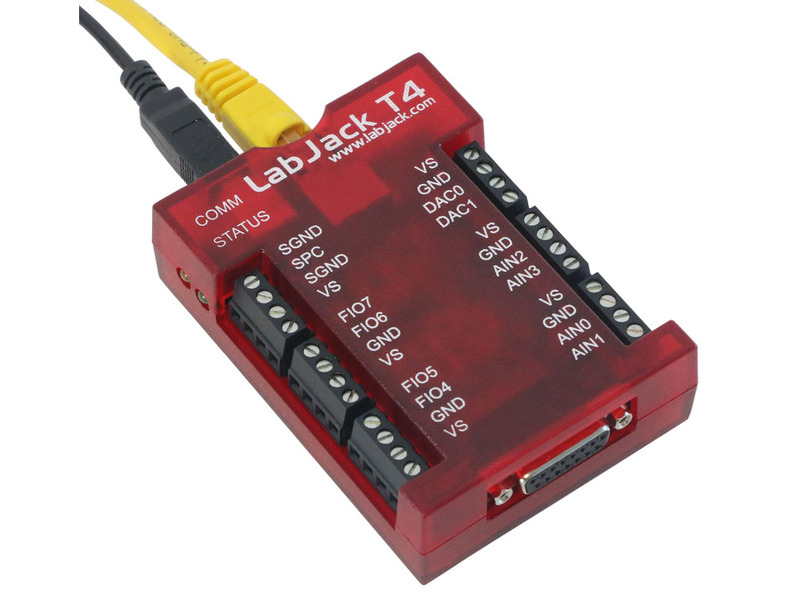 The LabJack U12 also has a watchdog timer function available which can change the states of digital I/O if the LabJack does not successfully communicate with the PC within a specified timeout period. This function could be used to reboot the PC allowing for reliable unattended operation. When used with a notebook PC, the LabJack U12 becomes a convenient portable data acquisition and control system. The watchdog timer function allows the development of a system which has the reliability of a datalogger with the power of a PC. The low-power design of the LabJack U12 allows it to draw all it's power from the USB port. Also, no UPS is needed when using a LabJack U12 with a notebook PC. In the event of power loss, both the LabJack and the notebook will continue to operate. By using USB hubs, up to 80 LabJacks can be connected to a single USB port, providing an inexpensive solution for low-speed high channel count applications. Includes various example applications, including LJlogger and LJscope. LJlogger provides datalogger type functionality. It reads all inputs, controls all outputs, writes real time data to disk, and sends email when events are triggered. LJscope is a simple virtual oscilloscope program. This software is free and can be downloaded from labjack.com for evaluation. Drivers are provided as a DLL which can be called from most programming languages. Also included are an ActiveX wrapper and LabVIEW VIs which call all the functions in the DLL. Most driver functions have a demo input, so applications can be developed and tested without hardware. Connect to the USB port on a PC running Windows 98SE/ME/2000/XP using the included cable. The low-level drivers, which come with Windows, will be installed automatically. Run the LabJack installation program to install the high-level drivers and example applications. The LabJack U12 comes complete, but we do offer a few optional accessories. 2/ The RB16 provides sockets for industry standard miniature I/O modules (solid state relays). 4/The EI-1040 is a single-supply dual instrumentation amp that provides high impedance and high gain. The LabJack UE9 has 14 external analog inputs (AIN0-AIN13) and 2 internal analog inputs (AIN14-AIN15). AIN0-AIN3 are available on screw terminals and also on the DB37 connector. All 14 analog inputs are available on the DB37 connector. Each analog input can be configured individually as unipolar (0-5 volts) or bipolar (±5 volts). An internal PGA provides gains of 1, 2, 4, or 8 (unipolar ranges only at this time). Analog input resolution is 12-bits at max speed (10 us conversion time), increasing up to 16-bits at slower speeds (10 ms conversion time). Analog inputs can be continuously streamed at up to 50 ksamples/second. Command/response (software timed) functions typically take a few milliseconds to execute. The LabJack UE9 has 2 analog outputs (DAC0 and DAC1) that are available both on screw terminals and the DB37 connector. Each analog output can be set to a voltage between 0 and about 4.8 volts with 12-bits of resolution. Up to 6 FIO can be configured as timers. The timers are very flexible, providing options such as PWM output, pulse timing, and quadrature input. Up to 2 FIO can be configured as 32-bit counters. Power can be provided by the USB cable or an external 5 volt supply (included). When only Ethernet is connected, and an isolated power supply is used (such as the included wall-wart), the entire UE9 is electrically isolated. By using USB hubs or Ethernet switches, many LabJacks can be interfaced to a single PC, providing an inexpensive solution for low-speed high channel count applications. Combining the UE9 with a standard 802.11 wireless Ethernet bridge ($50-$200 from any computer retailer) provides inexpensive wireless data acquisition. Applications include high-speed continuous wireless data acquisition, long distance remote sensing and control, or PDA based data acquisition.